Root canal. For many people, those two words conjure up an unpleasant memory of severe tooth pain and a trip to the dentist. But what everyone should really remember is how much better they felt AFTERWARDS. When a tooth becomes damaged or infected the pulp cavity can become exposed, which contains sensitive blood vessels and nerves. A root canal repairs a damaged tooth by removing the pulp and sealing the tooth to prevent further pain and discomfort. 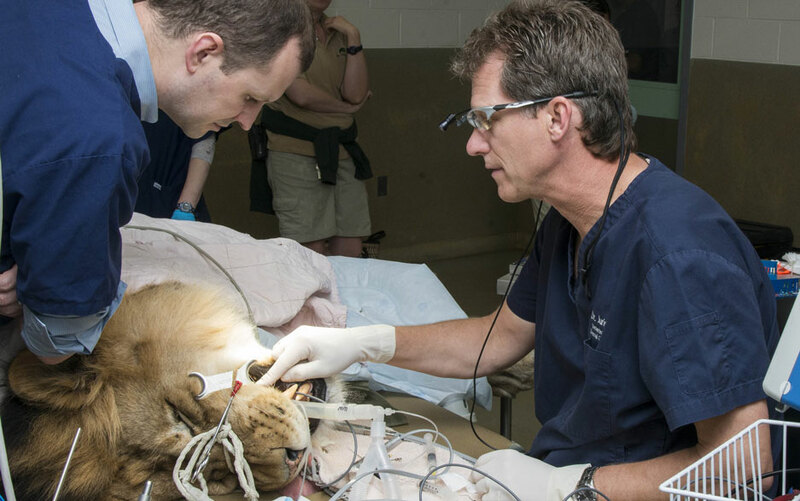 As part of the Chicago Zoological Society’s commitment to ensuring the best possible animal welfare, our animal care staff and veterinarians pay close attention to the dental health of all our animals. During routine medical examinations, we inspect, clean, and polish their teeth. Between exams, many of our animals are taught to open their mouth on cue, allowing care staff to keep a close eye on their teeth and alerting veterinarians to any possible problems. Zenda, one of our lions, recently received a root canal with the help of our consultant dentist, Dr. Stephen Juriga (pictured above: right). Just like people, animals can experience significant discomfort when a tooth is damaged and a root canal is a great way to alleviate that discomfort without removing the tooth. Zenda’s canines are about two inches in length, making his teeth quite a bit larger than the dogs and cats that Dr. Juriga typically works with. However, as an upshot there is plenty of room in his mouth for Dr. Juriga to work! Immediately following the procedure, Zenda was back in his habitat, eating his normal diet, and undoubtedly feeling much more comfortable.